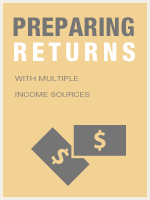 This illustrative course is designed to provide a more tangible experience to understanding tax preparation. The course content will identify possible sources of taxable income, examine self-employment income and the necessity to make estimated payments, and generally explains the initial steps taken at the beginning of the return process. Determine all sources of taxable and non-taxable income (e.g., wages, interest, business, sale of property, dividends, rental income, income from flow-through entities, alimony, government payments, and pension distributions). Self-employment income and expenses (e.g., Schedule C Profit or Loss from Business and Form 1099-MISC Miscellaneous Income, cash). Other income (e.g., alimony, barter income, hobby income, non taxable combat pay, state income tax refund from prior years, prizes). Sale of non-business assets (gains or losses). Self-employment tax (e.g., Schedule SE Self-Employment Tax). Understand payment options (e.g., check, direct debit, EFTPS, credit card, installment agreement-Form 9465).